How Do You Say Goodbye to a Child You’ve Never Met? Maybe the child you sponsor recently left the program. Maybe you sponsored a child in India, and you had to deal with the devastating loss of that child leaving the program far too soon. Whatever the reason, this is how you can say goodbye. 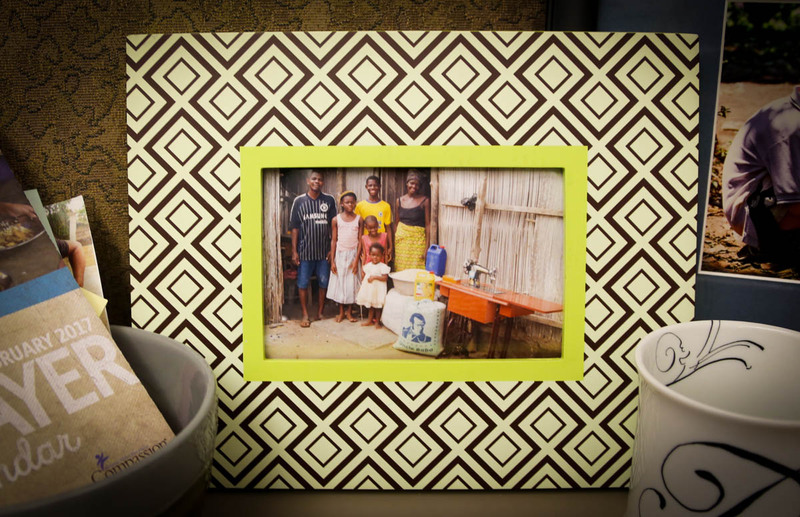 On my desk, there’s a picture of a family in Togo, a small country in West Africa. In that picture, a man and woman stand in front of a home with their four children gathered around them. But there should be five children. Akouvi is missing from the photo. I began sponsoring her when she was nine years old. And less than a year later, she passed away from complications related to malaria and kidney disease. To say losing a child you sponsor is devastating is an understatement. Whether that student graduates or passes away, whether their centre closes or their family moves away, it can feel almost physically painful to sever that tie. But as I grieved for Akouvi and her family, I found grace in knowing I spoke as much love into that little girl’s life as I could for the nine months I had the privilege to be her sponsor. When she sent me a letter with a drawing of flowers, I didn’t know it would be the last one. And when I wrote and told her about the snow where I lived, I also didn’t know that it would be my final words to her. But I know I signed that letter with “I love you.” And I find great comfort in that. Even though I didn’t get to say goodbye in my last letter, I got to tell that sweet little girl how precious she was. I may have never been able to say those words in person, but I know she heard them. When I sent that final letter to her family, I was able to tell them what an honor it was to be Akouvi’s sponsor. That I grieved along with them. That someone faraway loved that little girl. Months after Akouvi’s death, her family sent me that photo I have on my desk. I see it every day I’m in the office. And it inspires me. To speak words of truth and life and love into the lives of each child I sponsor. I may do it imperfectly. I may not do it as often as I like. But as long as I keep signing those letters “I love you” I know they’re making a difference. Maybe the student you sponsor with Compassion recently left the program. Maybe you sponsored a child in India, and you had to deal with the devastating loss of that child leaving the program far too soon*. I encourage you to write that final letter. Speak those final words of hope. And if you sponsor a child who still sends you drawings and tells you about their favourite food, will you take a moment to write to them today? To tell them I love you? I promise, you won’t regret it. This article originally appeared on the Compassion International blog. Please note, if you sponsored a child in India, we will do whatever we can to get your final letter to him or her. We will send stationery to all India sponsors to use for that final letter, and do our best to ensure that they are delivered through our India partners. You want to say goodbye. You want to write something that will encourage your sponsored child and be a source of strength for years to come. But what, exactly? If you’re not sure where to start with your final letter, why not include the four things sponsored children say they treasure most? Tell your sponsored child that you’re proud of them, that you believe in them, and that God has a plan for their life. Psalm 119:105 says, ‘Your word is a lamp for my feet, a light for my path’. Share a Bible verse that will encourage your sponsored child. Time and time again, children share how their sponsor’s love made them feel valuable. Put your feelings onto paper and let them know they’re loved. Your prayers not only make a difference: they give children hope for the future. If you sponsored a child in India, we recently sent you a special letter template to write to your sponsored child. Please contact us on 1300 22 44 53 if you haven’t yet received it.